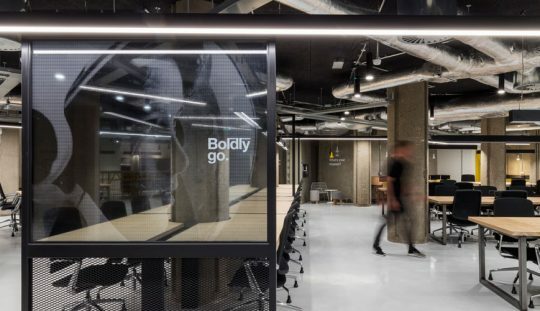 With RocketSpace’s new London tech campus LOM, FDP’s sister company, has sought to redefine the collaborative workspace. Chris Pyle talks design, interiors and a two year journey! In a city vibrating with young and ambitious start-ups, fuelled by disrupter mind-sets and boundless by technology, the physical spaces we inhabit too often fall desperately short of expectation. We continue to be surrounded by legacy buildings that are under-utilised, ill aligned to purpose or simply empty. London’s city shapers have a responsibility to rethink and redefine the physical spaces we work in today, if they are to remain relevant tomorrow. In RocketSpace’s London location, a number of forces have come together to inject new life into one of North London’s anonymous building masses. The result is a combination of components, spaces and materials precisely tuned to tech collaboration and so unique to RocketSpace as to set it apart. LOM was first approached in 2015 following an agreement between RocketSpace and NatWest. The B2B relationship would enable connections between the bank and innovative start-ups and drive the first of a global network of campuses starting with the UK capital. The first task was to increase the occupancy of the basement from 60 to around 500 people. Three additional openings were created across the 1,600 sqm floor. Locating openings in the reinforced structure was strategically planned not only to manage vertical loads but to shape the sequence of underground spaces. The double height loading bays, benefitting from the only source of natural light, have been transformed into an event space and cafe. The presentation area is the gravitational centre of the campus and includes bleacher seating and a 24 panel digital screen for presentations, web conferences and gaming. The internal volume has been optimised by introducing a new mezzanine level to accommodate media pods and flex-rooms. Deeper underground, the cash counting centre has become a workplace for RocketSpace members who don’t require or want a dedicated workspace. With an array of lighting we have maintained areas of illumination and shadow while aiming to overcome the underground feel. The exposed core is complemented by a utilitarian approach to services, referencing NASA space stations with exposed ductwork, metallics and flashes of colour. The cash vault presented a unique opportunity to reinvent. As the campus games room we aimed to create a juxtaposition of the 1950s and ‘60s; setting the golden age of space travel against the shrouded spy-scape cold war. Banquette seating, plush upholstered furnishings, a cinema lightbox and ornate billiard table provide reference to the auspicious activities of a former cash vault. The vault doors, bolts protruding, have remained untouched. Above ground, the upper floors have been divided into open plan dedicated workspaces and cellular office suite spaces using over 700 linear meters of acoustic glazed partitions. We have designed a completely bespoke desk system to maximise space usage and reflect the utilitarian aesthetic. Compact desk tops in lacquered ply sit above raw steel frames with cable management and slim-line pedestals to optimise ergonomics. All 1,000 fixed desks are powered height adjustable. The open plan desk workspaces provide for RocketSpace members who require increased levels of stability and personalisation. The cellular spaces occupying 80% of each floorplate, provide private office suites for campus members who desire more privacy and personalisation. Each has storage, writable glass walls and individually controlled lighting, heating and cooling. Secure access has been provisioned for a day 2 smartphone platform – and we’re politely waiting for technology to catch up! The office suite model itself is scalable with sliding pocket doors and units ranging from four to 32 positions to accommodate business growth. Viewing the campus as a whole reveals how the building has become integral to the RocketSpace model. The internal fit-out delivers a three tier membership by responding directly to the massing of spaces above and below ground. The basement simultaneously offers an entry level springboard and the campus networking space, while the upper floors provide focused business autonomy. The adjacencies of autonomous working to collaboration and networking are structured to create a rich ecosystem where diversity of members who are all focused growth on is the core strength: A platform that offers swift learning and rapid growth, placing individual tech start-ups with the next ‘big idea’ alongside some of the most established and innovative global brands.